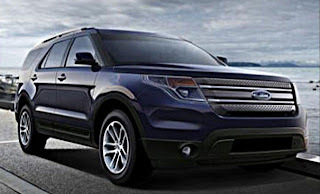 The best-selling SUV in North America in years past, the Ford Explorer's main selling point used to be its rugged reputation. Yet by the early 21st century, as buyers began to shy away from body-on-frame SUVs for more-efficient and better-driving crossovers, the Explorer became an also-ran in the sales race. The latest Explorer seeks to keep up with consumer tastes and reclaim some of its former sales glory with a unibody platform that provides car-like handling and increased fuel economy. Pricing for the V6 starts at $28,190, plus an $805 delivery fee. The XLT model comes in at $31,190, while the Limited variant starts at $37,190. With every possible option, a fully-loaded Limited will list for around $48,00. The all-new Explorer rides on a unibody platform derived from the automaker's D3 platform rather than the separate frame of the outgoing model. 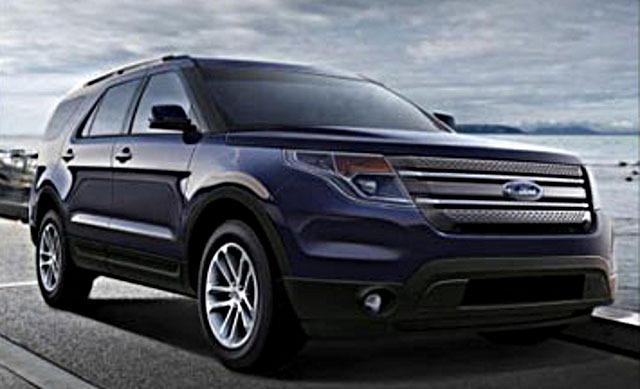 Substantially updated since the platform first debuted, it now underpins the Taurus, Flex, Lincoln MKS and Volvo XC90 in addition to the all-new Ford Explorer. With a road-oriented fully independent suspension and Ford's optional "intelligent" four-wheel-drive system, the Explorer isn't likely to challenge the body-on-frame Toyota 4Runner or similarly unibody-based Jeep Grand Cherokee for off road prowess. Instead, V6 Explorers can be equipped with a terrain management control knob based on former Ford subsidiary Land Rover's similar system. Offering snow, sand, mud and normal modes, the system simply requires a twist of a knob to properly set up the Explorer's all-wheel-drive and stability control systems for various types of terrain. The system will also include a hill descent mode for low-speed off road maneuvers. The Explorer also debuts a new EcoBoost turbocharged four-cylinder engine and it will offer a more powerful (and thirstier) V6. This 2.0-liter inline-four combines a turbocharger, direct injection and four valves per cylinder to deliver an estimated 237 horsepower at 5,500 rpm and 250 lb-ft. of torque from 1,750 to 4,000 rpm. Ford says that fuel economy is up 30 percent over the outgoing Explorer V6. The EcoBoost four-cylinder will only be offered with front-wheel-drive. For those who place a priority on power - and those who want to tow - the Explorer also features an optional 3.5-liter V6 that puts out 290 horsepower and 255 lb-ft. of torque. The naturally aspirated V6 also features direct injection and twin independent variable camshaft timing, which Ford says helps boost fuel economy by about 20 percent compared to the outgoing Explorer. With the V6, Explorer owners can tow up to 5,000 lbs. 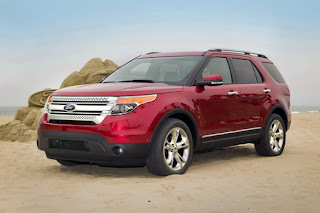 and the V6 is available on both front and all-wheel-drive Explorers. Both engines will be mated to six-speed automatic transmissions; XLT and Limited trim levels will feature a shifter-mounted +/- toggle switch for manual-style gearshifts. All models also feature electric power steering to reduce fuel consumption and assembly complexity. The electric steering combines with a new Curve Control feature, which works with the Explorer's stability control and brakes to stabilize a vehicle that has entered a turn too quickly. 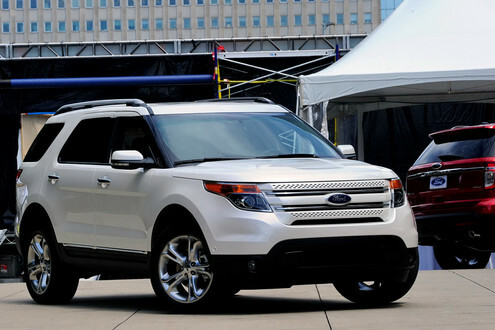 Ford will also offer the Explorer with its automatic parallel parking system that first debuted on the Ford Flex. With a length of 197.1 inches and a width of 90.2 inches including the exterior mirrors, the latest Explorer is a fair amount larger than the outgoing model - and it's one of the largest in its class, measuring in just three inches shorter than a GMC Acadia. It gains a much more swoopy look than before, although the canted C-pillar seen in the original two-door Explorer returns. 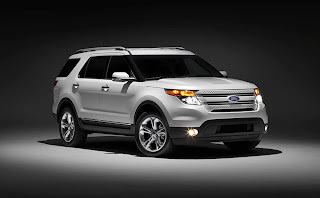 Part of the new Explorer's signature look, it also adds rigidity to the SUV's body structure. Inside, the new SUV features more room and three rows of seats, as well as a decidedly unique dashboard. Ford says that the Explorer features its highest quality interior. Ford offers the 2011 Explorer in three configurations, starting with the base model, equipped with 17-inch steel wheels with wheel covers, a 4.2-inch LCD screen to display vehicle information, cruise control, power windows and locks and a tilt and telescope steering column. Buyers can step up to the XLT to gain standard automatic headlamps, heated mirrors with LED turn signals, a kelyess entry keypad, reverse sensing and an alarm system and 18-inch alloy wheels. Additional features can be added to the XLT via option check boxes. The range-topping Limited adds power folding side mirrors, ambient lighting, power adjustable pedals, automatic climate control, a 10-way power driver's seat, an auto-dimming interior mirror, a rear-view camera, remote start and keyless access with push-button start, among other items. 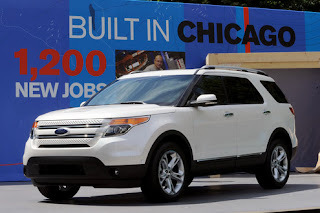 The Explorer will be exclusively produced at the automaker's Chicago assembly plant.